In the 1970s and ‘80s, a film in competition at the Karlovy Vary International Film Festival was lucky to gain any more than a handful of viewers. But now the Festival is regaining the international prestige it had in the ‘60s (before the Soviet tanks streamed into the country to quash its rising liberalism in 1968). It’s also getting back the buzz, and this year the vast majority of the 534 screenings sessions for the 292 films were full houses. Much of this was due to the student accreditation system the Festival operates, enabling young Czechs to see the best of world cinema for as little as half a euro a show. Queues were long by the time the student box office opened at 8am. It’s this student presence that creates the unique atmosphere of Karlovy Vary, with the thousands of students who descend on the small spa town in western Bohemia camping out under the stars or sleeping in their cars in order not to miss the Festival. It’s very much a young, public event (as opposed to, say, Cannes, which is an industry – and press-only event). Not everyone was totally enamoured with the student presence, however, with the personal hygiene of those camping out adding its own unique atmosphere to the less well-ventilated screening venues. The sell-out performances, hot weather and lack of a coin-operated laundrette in the town just exacerbated the problem. Perhaps more seriously, industry representatives at the Festival complained that it was hard to attend screenings as they were so packed with students. Several that I spoke to complained bitterly that the Festival was getting its priorities wrong, but when I asked artistic director Eva Zaoralová about this problem she denied that this was fair criticism, pointing out that its difficult to get seats, even for those with professional accreditation, at all successful festivals. No performances were busier than those screening Czech films, even those that had already had a theatrical release in the country. Compared to last year, there were few films from the veterans of Czech film, but to compensate there were plenty of star turns from younger directors. The darling of the new generation is Petr Zelenka, best known for directing Knoflíká i (Buttoners, 1997) and his script for David Ondříĉek’s Samotáři (Loners, 2000). His latest directorial offering, Rok ďábla (Year of the Devil, 2002), is billed as a story of angels from the land of silence and booze, and was not only in competition and the gala opener but also picked up the main prize, the Crystal Globe. Rok ďábla mixes real and imaginary people to create a mockumentary with all Zelenka’s trademark zaniness. It’s more culturally specific than his previous films, though, relying heavily on an appreciation of Czech folk music (the soundtrack went gold within a month) and recognition of the characters. It’s also somewhat over-laboured: I watched the film at a public screening, and the Czech audience chuckled heartily in the first 30 minutes of the film but were largely silent for the last hour. Nevertheless, Zelenka diehards will be delighted, and Jaz Coleman (formerly of Killing Joke) playing himself is a treat worth watching in itself. 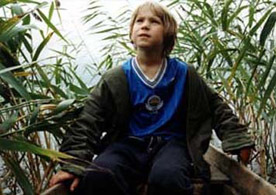 Bohdan Sláma’s Divoké vĉely (Wild Bees, 2001) also had a high profile, having won the best debut prize at San Francisco and shared the main prize at Rotterdam. Set in a decaying village in northern Moravia, the film loosely follows the loves and lives of young and old as they come to terms with their own hang-ups and personal failings. It’s an ostensibly bleak film, but one that manages to squeeze in plenty of good humour, and its problem stems not so much from its constant display of misery but from a rambling narrative that ultimately doesn’t pay off. Sláma’s talent is clearly visible, though, and he deserves high praise for the performances he draws out of his actors: Pavel Liška (the idiot in Saša Gedeon’s Návrat idiota [Return of the Idiot, 1999]) does the difficult task of making an obsessive Michael Jackson impersonator believable, while Tatiana Vilhemová (another Navrat idiota veteran) is more restrained but no less noticeable as the girl he loves. Divoké vĉely may not be essential viewing, but Sláma is definitely a director to watch. Zaoralová, speaking to the Festival daily, said that Czech audiences hate social engagement films of the type that Western critics love. Zdenék Tyĉ must be hoping she is wrong. Tyĉ, whose Smradi (Brats, 2002) was playing in competition, is one of several Czech directors (Sláma included) to have embraced contemporary social themes. In this case, the film is about a Czech (i.e. white) couple who have adopted two Romany children and are forced out of Prague by racism and the asthma of their own son. It’s a brave film in a country that is consistently criticised by the EU for its inter-ethnic relations. Tyĉ’s last film was voted worst film of the year in 1996 by the Czech film academy. Can he do it again? Other Czech films playing included: Jan “Kolja” Svĕrák’s desperate attempt at a second Oscar, Tmavomodrý svĕt (Dark Blue World, 2001); Miroslav Janek’s Nachové plachty (Crimson Sails, 2001), an artistic-poetic documentary on a floating theatrical performance by the Forman brothers; the late distinguished actor Vlastimil Brodský in his last performance in Babí léto (Autumn Spring, 2001) by Vladimír Michálek; and the Antonioni-inspired Paralelní svĕty (Parallel Worlds, 2001) by Petr Václav. However, one of the most eagerly awaited Czech films, Alice Nellis’s Výlet (Some Secrets, 2002), was not playing at Karlovy Vary, as it will play in competition at the San Sebastian film festival in September. Karlovy Vary traditionally makes a point of representing former Communist countries in the competition. This year was no exception, and along with the two Czech films were works from Poland, Russia and Latvia and a co-production between Hungary and Romania. Michał Rosa’s Cisza (Silence, 2001), scripted by former Kieślowski collaborator Krzysztof Piesiewicz, depicts a victim of stalking who uncovers the obsessive relationship after a chance friendship turns out to have more intense and premeditated origins. The first part of a proposed series of eight films about the stigmatised, Cisza is seemingly trying to cast itself as a successor to Krzysztof Kieślowski’s own cycle of moral inquiry, Dekalog (The Decalogue, 1989). At a press conference, Piesiewicz argued that the film is about the importance of coming to terms with the past. To many others, though, its portrayal of a woman falling in love with her stalker will be morally sickening and insensitive and outweigh Piesiewicz’s otherwise worthy aims. Budapest-born Gyula Gulyás fared only slightly better with Fény hull az arcodra (Light Falls on Your Face, 2001). Few countries have an awareness of their own history as much as Hungary, and this is clearly evident in its film heritage. Fény hull az arcodra continues this tradition, depicting the aftermath of a failed uprising in the 19th century and the burden of guilt that the survivors carry about their past. Despite such promising material, Fény hull az arcodra stands as proof that there’s far more to making an auteur film than framing the picture nicely and simply letting the shots run on a bit too long. The Russian film this year was also a historical piece, but this time aimed at a popular audience rather than an art house one. Zvezda (The Star, 2002), as director Nikolai Lebedev explained at a press conference, is a film to prove we are not only drunkards or hired hands, we have a past to be proud of. The past in this case is World War II, and, like Nikita Mikhalkov’s Sibirskii tsiriulnik (The Barber of Siberia, 1998), which also went out of its way to create a positive image of Russia, Zvezda has been well-received domestically at a time when the country has a distinct lack of contemporary heroes. Although trying to be a new type of war film (it is based on a book banned by the Soviet regime for its bleakness), Zvezda is curiously reminiscent of the many films made during the 1940s and ‘50s on the topic but with no trace of pastiche, knowing kitsch or irony. Far more attractive was Viesturs Kairišs’s Pa celam aizejot (Leaving by the Way, 2001), a modest but magical film that artfully combines the elliptical poetic tradition of filmmaking with engaging storytelling. The plot loosely revolves around a nine-year-old boy, Dauka, who awaits the return of his naval officer father. Paralysed by fear, though, his mother cannot tell him or his sister that the man is dead, and the pressure of keeping the secret in the isolated rural community starts to show. With soaring, ethereal Baltic music, Pa celam aizejot is a film that can only be described as beautiful and intense, adjectives that can only rarely be applied to cinematic works these days. Sadly, many critics, presumably ones with a liking for linear narrative and central characters you can identify with, were rather less impressed with the film. Their loss. As a result of the feeble competition line-up, most people’s favourite films were playing in sidebars. Scattered across a number of categories, the non-competition Russian films were particularly worthy of attention. For those who hadn’t caught it in Cannes, there was the delight of Aleksandr Sokurov’s Russkii kovcheg (Russian Ark, 2002), an exploration of Russia’s present through a twisting journey through its past. The feature will naturally do well, propelled by the press surrounding the unusual background to the film—it was shot on High Density (HD) video in a single take on location in St Peterburg’s opulent Hermitage with a cast of thousands. Ironically, the effect of the single take is rather spoiled by the necessity of cutting the 35mm film, on to which the video images were transferred, into reels. Nevertheless, this is a film that is as emotionally intense and intellectually provocative as it is technically ambitious, and even those who are not cult followers of Sokurov (whose films are a regular feature of Karlovy Vary) will find their jaws dropping in awe at the film’s closing sequence. Theatrical releases are certain, thus allowing the director to consolidate on the reputation he built with non-festival-goers with Mat’ i syn (Mother and Son, 1997). Russkii kovcheg is unlikely to prove to be blockbuster material. But what are the chances of Aleksandr Rogozhkin’s Kukushka (Cuckoo, 1992) in the light of the international box office success of Danis Tanoviæ’s No Man’s Land (2001)? Kukushka covers similar ground, with two soldiers from opposing sides reluctantly forced to co-operate when they are both condemned to death by their own armies. This time, it’s a Finn and a Russian and the period is the Great Patriotic War, as Russians call the 1939-45 conflict. If there wasn’t enough capacity for slapstick confusion already in the scenario, an attractive young Lapp widow (who speaks neither Finnish nor Russian) is thrown in for good measure. But this is just the burlesque filling in the sandwich, around which are two haunting and masterfully tense pieces of filmmaking that give the whole picture a poetry unusual for this style of comedy. Kira Muratova’s Chekhovskie motivy (Chekhovian Motifs, 2002), as its title suggests, loosely draws on the short stories of Anton Chekhov, and uses them for new purposes. The story is that of a young student, Peter, who tries to leave home and his dictatorial father. En route to the city, he ends up gate-crashing the farcical wedding of a couple of New Russians, an experience which causes him to reconsider whether the city is right for him. It’s a witty and incisively observed modernisation of Chekhov’s obsession with the gentry’s existential fear of banality and it deserves more attention in festival audiences than it is likely to get. The only Russian film to walk away with a prize was Sergei Bodrov’s Sestry (Sisters, 2001), which snatched the Freedom Prize for films from former Communist countries in the East of the West side bar. The directorial debut of the young star of Aleksei Balabanov’s Brat series of films, Sestry is rather derivative gangster flick that makes no concessions towards having intellectual weight. Perhaps it was for this reason that there was much grumbling from some representatives of countries that had lost out on the award that such a populist film had won an award whose name has political-philosophical overtones. Whilst I myself found the jury’s decision somewhat surprising, it has to be conceded that Bodrov’s film was far more tightly paced and watchable than most in the same section. Hollywood filmmaking orthodoxy has it that the heroes should be well and truly good and villains should be well and truly bad. The countries of central and eastern Europe, however, have little respect for this convention, and often gain their power by making us sympathise—even empathise—with totally unlikeable characters in their exploration of the human condition. It’s rarely a recipe for international box office success, but it often (but not always) produces some beautiful and intense films. Many people will know the work of István Szabó purely by his Oscar-winning Mephisto (1981). Taking Sides (2001), his most recent film, sees the great Hungarian director still toying with the same themes. Set at the end of the Second World War, the film is a battle of minds between the esteemed German conductor Wilhelm Furtwängler and a zealous American commander trying to prosecute him for lending his support to the Nazi regime. Despite the fact that Szabó is going over well-trodden ground here, the film is remarkably gripping. Its oddity lies in mixing moments of intimate chamber drama (the film is based on Ronald Harwood’s play of the same name) and pricey showpiece reconstructions of post-war Berlin in ruins. The suitably weighty performances from Harvey Keitel and Stellan Skarsgård can’t stop you wondering if the film might have had more edge to it had it been given to a younger director with a smaller budget. Any film that is billed as Moldovan is a novelty in its own right. The country, a former part of the Soviet Union wedged between Romania and Ukraine, is the poorest in Europe, having recently overtaken Albania. Viorica Mesina and Sergiu Prodan’s Patul lui Procrust (The Procrustean Bed, 2001), however, is a remarkably lavish literary adaptation of a Romanian classic (helped along with a US co-producer to provide cash). It’s also surprisingly satisfying, with fine balancing of the characterisation of the main protagonist creating someone instantly attractive and totally flawed, a person totally devoid of depth and yet one the audience can identify with. Despite its awkwardly bookish ending, it was one of the most charming adaptations I’ve seen from the region in some time. Romania itself was represented by Rotterdam co-winner În fiecare zi dumnezeu ne saruta pe gura (Every Day God Kisses Us on the Mouth, 2001), directed by Serbian born, Sinisa Dragan. The film, reminiscent of Serbia’s Black Wave films, focuses on Dimitriu, a man whose rage leads him accidentally to become a multiple murderer as successive arguments spiral out of control. Superbly rendered in black and white, În fiecare…contains passages that are unexpectedly realistic depictions of what leads such tragic characters to murder while the images bubble with symbolist significance. Occasionally, some parts are less convincing, and the enigmatic ending is bound to tease. If you like your films to show social misery, guilt and existential angst, then the cheerfully entitled Bulgarian-Macedonian co-production Sadbata kato plach (Fate as a Rat, 2001) is the film for you. Director Ivan Pavlov has been accused by Bulgarians of actively hating the protagonists in this tale of a group of 40-something drinking companions living at the bottom of society. Pavlov, however, denies it. A rather more humorous depiction of utter misery comes from Slovenia, with Jan Cvitkoviĉ’s festival hit Kruh i mleko (Bread and Milk, 2001), still doing the rounds after its success in Venice last year. 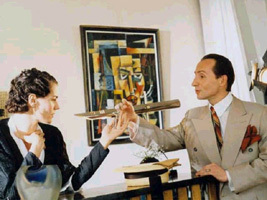 Boomerang (2001) by Serbia’s Dragan Marinković was by far the most slapstick use of the unlikeable character trope. Bringing together an ensemble of deranged and stereotypically Balkan losers, this madcap farce ends by begging us to forgive the characters for their immaturity. It’s a moving and effective address, seemingly to the international community, to be more patient and more involved in southeast Europe. Lobbying aside, though, it’s an unremarkable comedy that under-uses a cast that includes such talent as the famed Lazar “Underground” Ristovski. As is usually the case, I left Karlovy Vary only seeing a fraction of the films I would have liked to have seen. Some, I hope I will meet at other festivals with good representations of east European film. Others, alas, I am less likely to meet, an inevitable consequence of the sheer range of films from the region on show here, which other festivals find hard to match. This factor alone is bound to keep Karlovy Vary as a much attended film festival, whatever problems it has with ticket availability and body odour. Even these will be alleviated slightly if the Festival gets its way in persuading the town to build a new 600-seated cinema. The official reason is that the Festival needs more venues with hi-tech projection equipment to meet the demands of producers sending films to the Festival. It would be hard to imagine that air conditioning won’t be joining the Dolby Surround if the project does go ahead, though. See Andrew James Horton, “A Window Both Ways – Central and East European film at the 36th Karlovy Vary International Film Festival“, Senses of Cinema, issue 16, Sept-Oct 2001.